On Tuesday, April 9th, SB 7096 will be heard in the Senate Appropriations Subcommittee on Transportation, Tourism, and Economic Development. This bill is currently moving forward in both the Senate and the House and we need to take every opportunity available to tell our Senators to VOTE NO on this Anti-Voter Initiative Bill. If your Senator is listed below, they sit on the Senate Appropriations Subcommittee on Transportation, Tourism, and Economic Development, and will be voting on this legislation next Tuesday, April 9th. This might be your final opportunity to act before it goes to a full Senate vote, so call their office and urge them to stand up for YOUR Constitutional Rights by voting NO on SB 7096. This Bill will make the already burdensome process of having an initiative placed on the ballot nearly impossible. Of the states which allow for a citizen’s initiative, Florida already has the most difficult requirements to place an item on the ballot and have it pass once there. Phone calls to offices are great, but there are other options to contact your representatives if they do not sit on the committee that will take this crucial vote on Tuesday. CLICK HEREto sign the petition urging your Legislators to VOTE NO on this voice-stealing legislation. CLICK HERE for a list of Legislators and their Twitter handles. Tweet your Senators and Representatives to let them know they need to oppose this anti-voter legislation with the hashtag #FLVoterVoice. Some of the past citizen initiatives have led to rights restoration, homestead exemptions, increased minimum wage and tax exemptions. These are not frivolous amendments and represent the wishes of the citizens who worked to place them on the ballot and those who voted to enact them. This is an important bill that could have lasting ramifications on the future of our democratic process and constitutional rights. 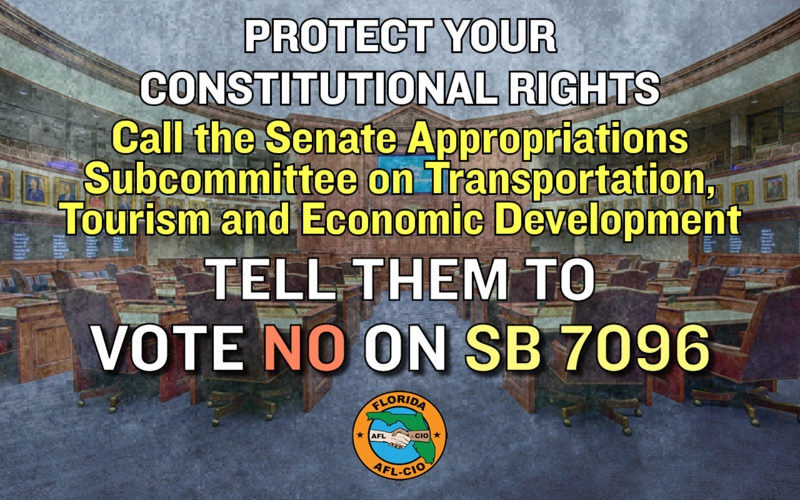 Call the Senate Appropriations Subcommittee on Transportation, Tourism, and Economic Development and tell them NOT to further erode your Constitutional Rights by voting NO on SB 7096. The battle for Florida’s future continued in week five of Legislative Session. The politicians have drawn the battle lines and Working Families Lobby Corps Activists were there to meet them head on. Hopefully for the future of Florida they will be able to stand up to the Legislature and special interests looking to bring certain apocalypse on the state. As interim committee weeks begin for the 2019 Legislative Session, are you ready to take action at the capitol to defend the rights of working people in our state? The Working Families Lobby Corps is now entering its 9th year of holding our elected officials accountable all session long, and your voice will help defend workers rights in Tallahassee. Click here to learn more about our WFLC program and how you and your union can make a difference in the legislative process this year. Week 4 saw the biggest attack on working families so far during the 2019 Legislative Session. This week the activists in Tallahassee faced further cuts to public education, arming teachers, preemption of local ordinances and an unconstitutional attack on our democratic process. Watch this week’s video to see how they fought back against the impending apocalypse this legislation threatens to bring. On Monday, April 1st, SB 7096 will be heard at 4:00 p.m. in the Senate Judiciary Committee. This bill continues a decade-long attempt to eliminate your ability to amend the State Constitution through ballot initiative. If your Senator is listed below call their office Monday April 1st before 4:00 p.m. and urge them to stand up for YOUR Constitutional Rights by voting NO on SB 7096. 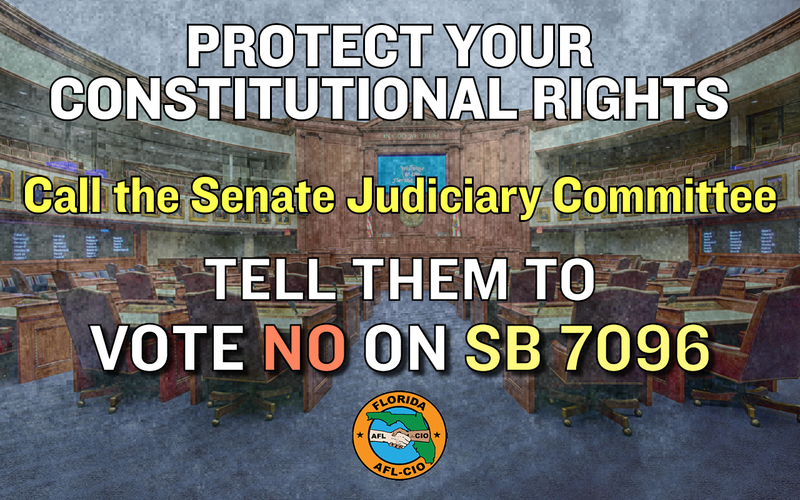 Call the Senate Judiciary Committee and tell them NOT to further erode your Constitutional Rights by voting NO on SB 7096. TODAY, Tuesday, March 26th, SB 7030 will be up for its next vote in the Senate Infrastructure and Security Committee. Instead of properly addressing the needs facing Florida’s teachers, staff and students, this bill is a quick and inexpensive fix that ignores the systemic failure facing our state’s education system. If your Senator is listed below call them NOW and urge them to stand up for school safety by voting NO on SB 7030. If school safety was truly a concern for the Legislature, they would choose to support funding for critical services such as resource officers for every school and a sufficient number of trained mental health professionals. This bill ignores the important role guidance counselors, school psychologists and social workers have in the education system. Professional educators know, and the voting public agrees, that teachers should not be armed with guns; instead they should be armed with better salaries and working conditions. 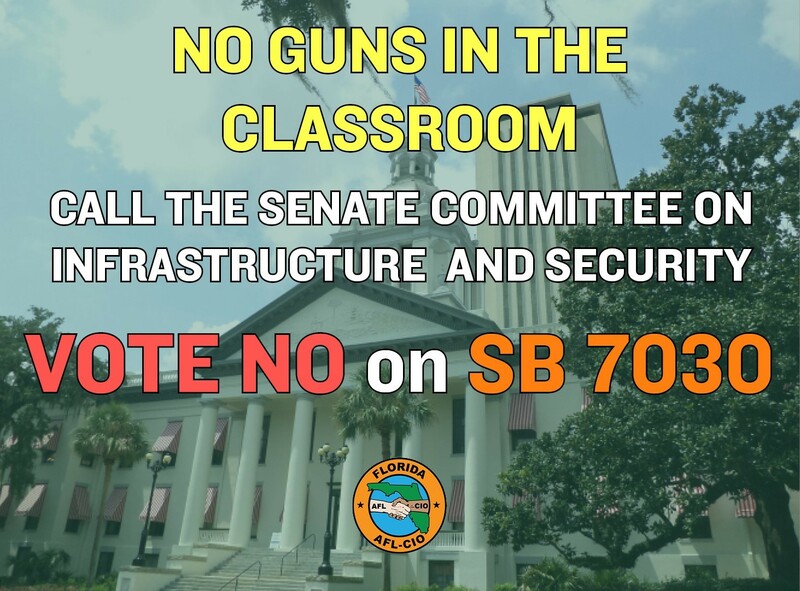 Tell the members of the Senate Committee on Infrastructure and Security NOT to arm teachers and to vote NO on SB 7030. Student and staff safety is an issue of the utmost importance; we must address the underlying causes of bullying and violence on school campuses including mental health issues. Florida’s schools are woefully understaffed with average student to staff ratios of 458:1, 1,951:1 and 2,003:1 respectively for school counselors, psychologists, and social workers. Each of Florida’s 67 counties has unique needs, and each county knows best how to invest in ensuring student safety. The legislature must support local control and allow for flexibility in how school safety money is spent. Please oppose any legislation that would allow more guns carried on campus by anyone other than trained law enforcement. The Marjory Stoneman Douglas Commission presented dozens and dozens of recommendations towards school safety. Arming teachers should be the last recommendation considered by the legislature – not the first. Teachers have a paramount duty to educate our students. They already take on more responsibilities than just teaching – they shouldn’t be asked to handle a firearm to protect their students as well. The massive assault on Working Families continued in week three of Legislative Session, with lawmakers aiming to eliminate public education, school safety, healthcare access and fair working conditions. Watch as the brave Working Families Lobby Corps activists fight to save Florida from certain apocalypse. TOMORROW, Wednesday, March 20th, SB 7030 will be up for its next vote in the Senate Infrastructure and Security Committee. Instead of properly addressing the needs facing Florida’s teachers, staff and students, this bill is a quick and inexpensive fix that ignores the systemic failure facing our state’s education system. The Legislature continued their attack on Florida’s future in week two of the 2019 Legislative Session. Thankfully for future generations intrepid activists have been sent back in time to stop the impending apocalypse threatening the state.